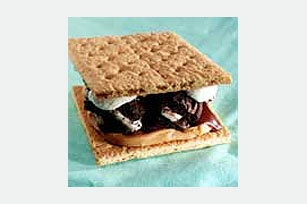 Our s'mores are just as good as you remember them, only we've added creamy peanut butter to the classic campfire treat. Spread 1 tsp. of the peanut butter onto each of 9 of the graham squares. Top each with about 1 Tbsp. of the chopped cookies, 1 tsp. of the fudge sauce and 3 or 4 marshmallows. Cover each with second graham square to make s'more. Place 4 or 5 of the s'mores on microwavable plate. Microwave on HIGH 10 to 15 seconds or until marshmallows begin to melt. Repeat with the remaining s'mores. Serve warm. Substitute peanut butter sandwich cookies for the OREO Cookies.